Cerebral venous sinus thrombosis (CVT) is becoming recognized as a more common and treatable disorder in young patients. Unfortunately, headaches are overwhelmingly common complaints in the emergency department (ED), so CVT can be easy to miss since it has confusing clinical and imaging findings. Emergency medicine (EM) physicians should be aware of various clinical presentations as well as risk factors. While it only represents about 1% of all strokes , its higher proportion of stroke in young patients makes it more relevant to the EM provider. Interestingly, an incidence of 9.3% of CVT was found on a pathology study , suggesting it is very under diagnosed in the ED. The most clear cut risk factors for CVT are hypercoagulable states. This category is broad including malignancy, inflammatory state such as crohn’s disease, mechanical trauma, pregnancy and genetic thrombophilia . The risk factor most reflected in the ED population was oral contraceptive use. A great proportion of young women are OCP users, and one small study of 40 women with CVT found up to 96% of cases were associated with OCP use . The overwhelming majority of patients present with headache . The presentation patterns are secondary to the underlying pathology associated with cerebral thrombosis. Local ischemia from impaired venous drainage and secondary edema and hemorrhage leading to intracranial hypertension can have different deficits, but in general cause intracranial hypertension and thereby pain. The headache character is unique from classic migraine in that it typically worsens with effort such as valsalva maneuver and when recumbent. In addition, up to 40% of patients presented with first time seizure . Patients can also have focal deficits and changes in mental status on more severe presentation, but these cases are not as likely to be missed as they would get further investigation and more advanced imaging than an isolated headache or first time seizure patient might receive. CT, CT venography (CTV), MRI and MRV (time of flight or contrast-enhanced MRV) are among the radiology options to diagnose CVT, but in the emergency department, both time and cost have increased importance than in the sub-acute setting. Non-contrast head CTs are routinely done for headaches or new neurologic findings in the ED, but have low sensitivity for venous thrombosis, missing a large proportion of patients. Plain CT brain only identifies the abnormalities found in CVT about 30% of the time . 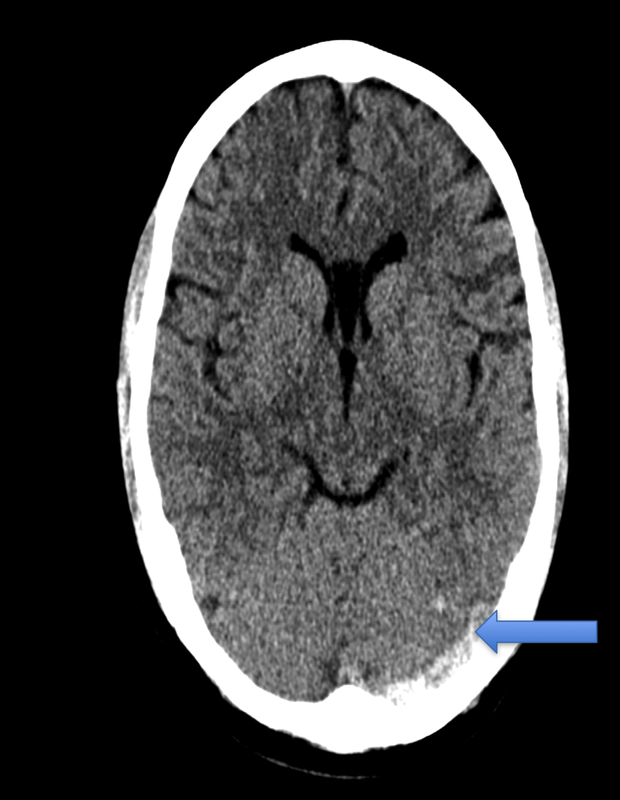 The main finding on plain CT is a hyperdensity of a cortical vein or dural sinus with possible secondary or indirect signs such as hemorrhage or edema (Figure 1). MR has been the method used most commonly to identify CVT historically, but no randomized controlled trial has been done comparing MR to CT venography. CTV has proved to be a reliable method to investigate the structure of the cerebral veins, with a reported sensitivity of 95% (7,8). CTV may show a filling defect within the vein or sinus, the classic “empty delta” sign, in which a central hypodensity is present (Figure 2). CT venography is now readily available, faster, cheaper and just as if not more reliable in detecting cerebral venous thrombosis than MR, though data is limited. In women on hormonal contraceptives with new or worsening headache, clinicians must consider cerebral venous thrombosis and get an appropriate diagnostic test to evaluate for this disease. This is a great review of a common and treatable cause of headaches that is often overlooked. The typical work up of acute thunderclap atraumatic headache focuses on detection of hemorrhage through head CT and lumbar puncture (though the latter may not be necessary if normal head CT is obtained within 6 hours from headache onset). This is a reliable approach to detect subarachnoid hemorrhage, such as in a ruptured aneurysm, or parenchymal hemorrhage from an arteriovenous malformation or hypertensive hemorrhagic stroke. Unfortunately, the CT/LP approach is not reliable for detection of venous thrombosis. One way to increase head CT detection for CVT is to raise concern for the entity with clinical history. Findings of CVT on regular head CT can be subtle, but the diagnosis can often be made if the radiologist is experienced and the clinical context is provided. I think the 30% sensitivity for CVT on head CT sounds low in the proper hands. In my experience, the overwhelming majority of patients presenting to the ED with CVT are young dehydrated women on OCPs. In an inpatient setting, apart from recent craniotomy, oncologic patients undergoing treatment seem to be the most common. From an imaging perspective findings are usually subtly present on non contrast CT. CT angiography (CTA), typically obtained to identify an aneurysm, is usually diagnostic as the contrast bolus is typically broad enough to have spread into the veins as well as the arteries. If there is a high clinical suspicion for CVT clinically and the patient is to undergo CTA an additional delayed CT can be obtained during the venous phase to evaluate the sinuses. This takes minimal extra time and requires no additional contrast, although does raise the radiation dose. When CVT goes on to cause parenchymal findings (i.e. venous infarction) the imaging findings are more easily identified though commonly misinterpreted. To the inexperienced imager a venous infarct can look very similar to a tumor, particularly in the clinical setting of a seizure. Unfortunately, this can lead to unnecessary trips to the operating room. One additional entity to consider that can present with a thunderclap headache without subarachnoid hemorrhage is reversible cerebrovascular constriction syndrome (RCVS). This is a poorly understood entity leading to vasospasm in otherwise healthy patients. Proposed causes include recreational drug use (cocaine, cannabis), recent pregnancy, exertion (often linked to sexual activity), and certain prescription medications (SSRIs and acute migraine medication). I bring it up here because like CVT it is treatable, can lead to irreversible complications, has subtle imaging findings, and is often overlooked as a cause of acute headaches in an outpatient or ED setting. RCVS is best diagnosed with CTA as subtle narrowing (vasospasm) of the basilar and cerebral arteries. If untreated it can result in arterial infarctions. It is typically treated with calcium channel blockers which may be administered intra-arterially if severe. Stam J. Thrombosis of the cerebral veins and sinuses. N Engl J Med 2005; 352:1791. Towbin A. The syndrome of latent cerebral venous thrombosis: its frequency and relation to age and congestive heart failure. Stroke. 1973;4:419–430. Ferro JM, Correia M, Pontes C, et al. Cerebral vein and dural sinus thrombosis in Portugal: 1980-1998. Cerebrovasc Dis 2001; 11:177. Martinelli I, Sacchi E, Landi G, et al. High risk of cerebral-vein thrombosis in carriers of a prothrombin-gene mutation and in users of oral contraceptives. N Engl J Med 1998; 338:1793. Ferro JM, Canhão P, Stam J, et al. Prognosis of cerebral vein and dural sinus thrombosis: results of the International Study on Cerebral Vein and Dural Sinus Thrombosis (ISCVT). Stroke 2004; 35:664. Saposnik G, Barinagarrementeria F, Brown RD Jr, et al. Diagnosis and management of cerebral venous thrombosis: a statement for healthcare professionals from the American Heart Association/American Stroke Association. Stroke 2011; 42:1158. Leach JL, Fortuna RB, Jones BV, Gaskill-Shipley MF. Imaging of cerebral venous thrombosis: current techniques, spectrum of findings, and diagnostic pitfalls. Radiographics 2006; 26 Suppl 1:S19. Mahmoud MAL, Elbeblawy MMS. The role of multidetector CT venography in diagnosis of cerebral venous sinus thrombosis. Research J Med Med Sc. 2009;4:284–9.